CYBEX sees beyond today's trends to deliver a new and honest approach to cross-training - the "right way to work out." The Arc Trainer series was developed with the "correct arc of motion", a user-friendly path that reaches new heights in biomechanics. It delivers a safe, effective workout based on body basics, not fitness fads. The CYBEX Arc Trainer - winner of the prestigious Nova7 "Product of the Year" award two years in a row - is biomechanically suited to the human body - allowing the user to get better results in less time. A Commercial High End cross trainer for the user who wants to concentrate on lower body training only. Popular with coaches and trainers, the Lower Body Arc is often chosen because it gives added workout flexibility (i.e. a strength coach found players could lean forward and "drive back" with their legs unhindered by the arm movement). The 750A Arc Trainer has all of the features of the Total Body Arc Trainer without the Arm motion. 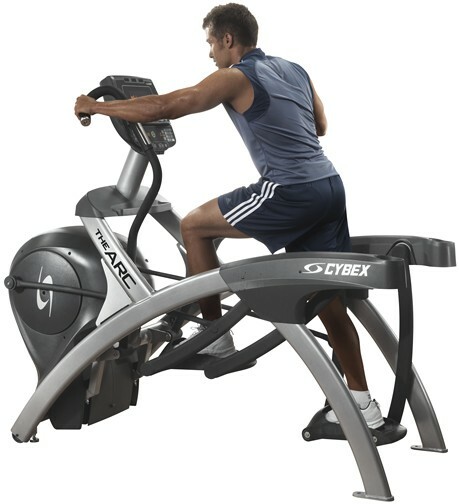 CYBEX sees beyond today's trends to deliver a new and honest approach to cross-training - the "right way to work out." The Arc Trainer series was developed with the "correct arc of motion", a user-friendly path that reaches new heights in biomechanics. It delivers a safe, effective workout based on body basics, not fitness fads. The CYBEX Arc Trainer - winner of the prestigious Nova7 "Product of the Year" award two years in a row - is biomechanically suited to the human body - allowing the user to get better results in less time.